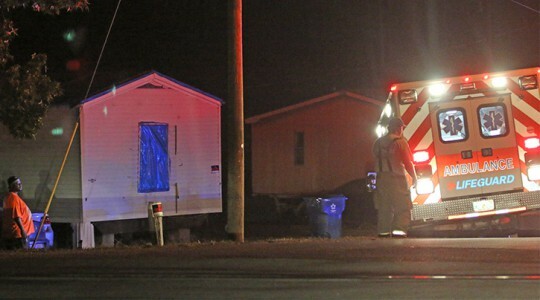 Authorities are searching for a suspect in connection with a stabbing Sunday night in Century. One person was stabbed at a mobile home in the 300 block of East Pond Street about 8:30 p.m. Sunday. The victim was transported by Lifeguard ambulance to EMS Post 50 in Century and then transferred to LifeFlight helicopter and airlifted to a Pensacaola hospital. No details on the victim’s name, age or condition were released. 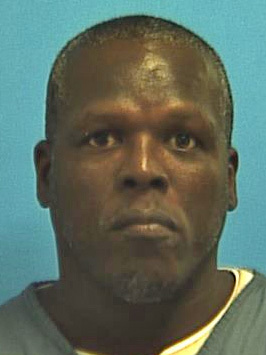 Alfreco Lett, 44, was named as the suspect in the stabbing, according to the Escambia County Sheriff’s Office. 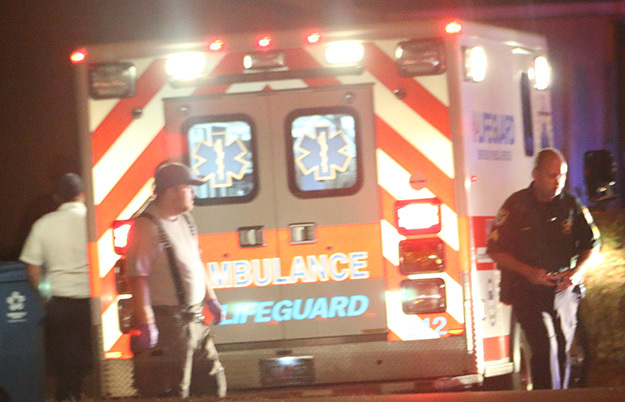 He fled the scene on foot, according to Rhonda Ray, spokesperson for the Sheriff’s Office. His direction of travel was unknown. Anyone with information on the whereabouts of Lett is asked to call Crime Stoppers at (850) 433-STOP or the ECSO at (850) 436-9620. Monday: Sunny, with a high near 88. North wind around 5 mph becoming southeast in the afternoon. Monday Night: Clear, with a low around 54. South wind around 5 mph becoming northwest after midnight. Tuesday: Sunny, with a high near 87. Northeast wind around 5 mph becoming southeast in the afternoon. Tuesday Night: Partly cloudy, with a low around 60. South wind around 5 mph becoming east after midnight. Wednesday: Partly sunny, with a high near 83. Southeast wind 5 to 10 mph. Wednesday Night: Partly cloudy, with a low around 60. Southeast wind around 5 mph becoming calm in the evening. Thursday: Mostly sunny, with a high near 83. East wind around 5 mph becoming calm. Thursday Night: Partly cloudy, with a low around 61. Calm wind becoming west around 5 mph. Family members say it was a miracle that 83-year Shirley Cooey was found near Century Saturday after being missing for a week. Cooey was located off Highway 29 on North Canoe Road, a non-maintained dirt road. 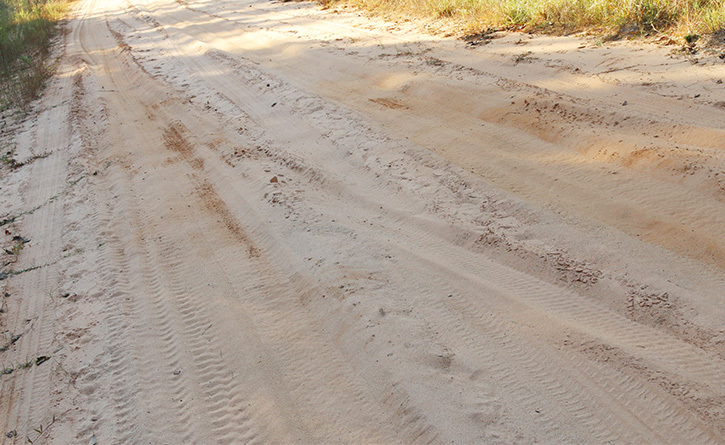 Her car was stuck deep in the sand of the roadway, where she had apparently spent most of the week. 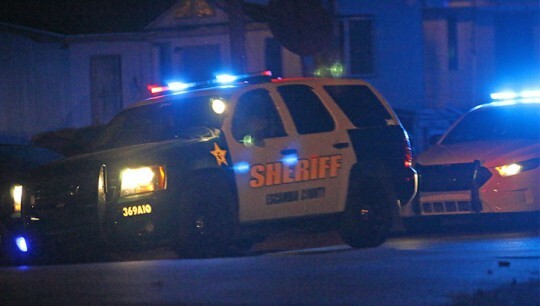 She was located by two Escambia County Sheriff’s Office deputies who responded to a report of a suspicious person. 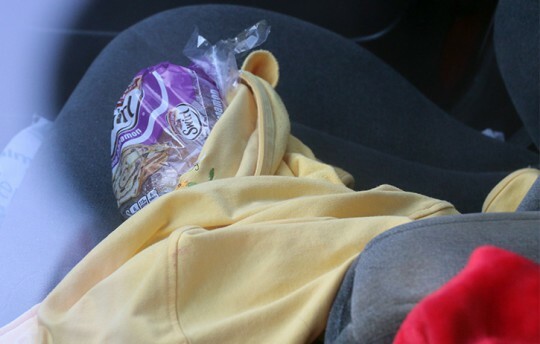 Cooey had apparently been living out of her car, which had a dead battery. She had food…an uneaten loaf of cinnamon bread was on the passenger seat after her rescue. But her major problem was a lack of liquid. 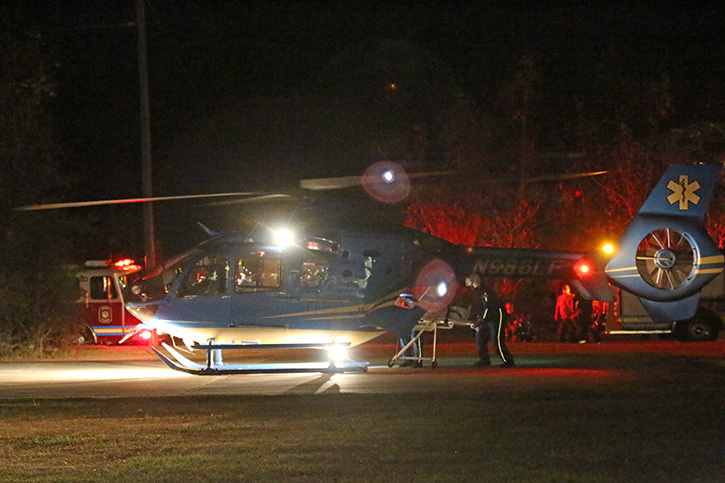 She was transported to an area hospital suffering from dehydration. Lindsay Cooey said there were times she doubled that the missing senior would be found alive, but her faith and love for God pulled her through. 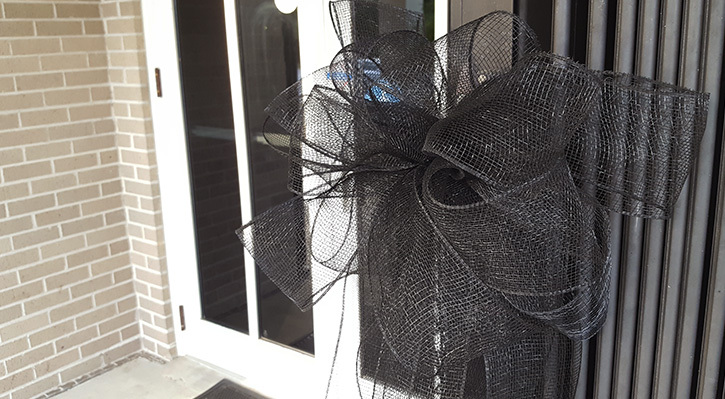 Funeral services were held this weekend for Century Town Council member Annie Carter Savage who passed away last week at age 75. For more on her passing, click here. Mr. Speaker, I rise today to honor the life and dedicated service of Annie Carter Savage of Century, Florida who passed away on October 25th, 2016. Annie was a remarkable public servant who cared deeply for those in the community she served, and I am humbled to commemorate her life. Annie Carter was born to Thomas and Rosa Bell Carter in Wilcox County, Alabama on February 16, 1941. She attended Snow Hill Institution Normal and graduated Industrial Institute in Snow Hill in 1960. Following her graduation, Annie went on to pursue a cosmetology license in Birmingham, Alabama. From there she began her career with Mutual Savings Insurance Company, where she spent more than twenty years before retiring as a district manager. In 2011, Annie was appointed to the Century Town Council. Annie was a dedicated and effective public servant, and she won the confidence of her constituents, as evidenced by her election to serve a second four year term as a councilwoman. In addition to her service to the Northwest Florida community, Annie was also a leader in the civic and religious community. For over sixty years, Annie remained a loyal and active member of the First Mt. Zion Baptist Church in Century, Florida. 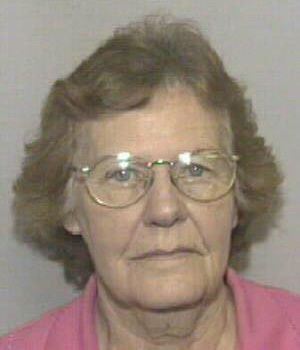 She served as church clerk for 28 years and in the church’s senior choir for 19 years. 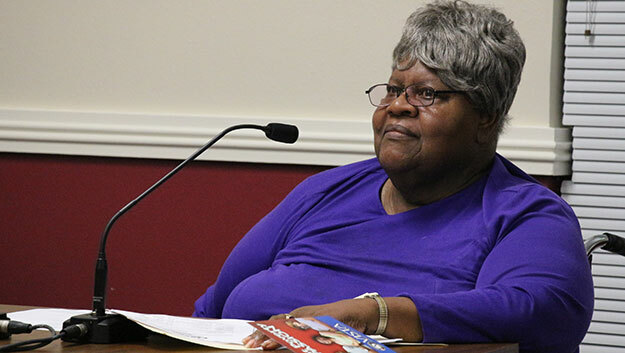 She also served as the district missionary for the First West Florida District Association, corresponding secretary for the Evergreen District Congress of Christian Education and remained a faithful member of the Eastern Star. Caring for the community was more than a passion for Annie. In 2009, she and her husband opened their home as an outreach ministry to for those in need of hot meals, transportation and spiritual guidance. Mr. Speaker, on behalf of the United States Congress, I am privileged to honor the life of Annie Carter Savage. 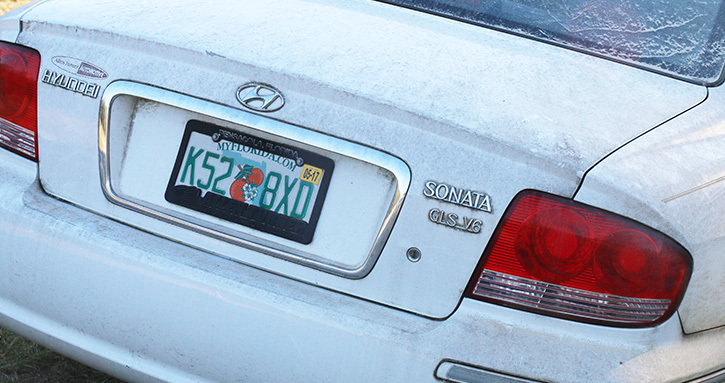 She will always be remembered by all of us in Northwest Florida as a true community leader. My wife Vicki and I offer our prayers for her husband, Deacon Lloyd Savage, three daughters; Lomonica Savage-Shoemo, Tarrant Savage, and Melody Trice; three grandchildren; two great-grandchildren; and the entire Savage family as we remember and honor the life of Annie Carter Savage. I was saddened today to hear that Councilwoman Annie Savage passed away. She gave selflessly to the town of Century, and her contributions will be missed. Leslie and I will keep her family and friends in our prayers as they mourn her passing. She spoke her peace and let you know what was on her mind. I have enjoyed working with her. We are all going to miss her. All healthy communities need true public servants, and Century needed Annie Savage, who was a true public servant. She will be missed throughout Escambia County and my thoughts and prayers are with her husband, children, and large extended family, as well her even larger network of friends during this trying time. As a former commissioner for District 5, I am saddened by the passage of Councilwoman Savage. Our prayers are with her family. She love this town and had nothing but the best in her heart for the town. She was always positive about life and God; I really respected her. She was a member of my church, a family friend and a really nice lady. She would do what had to be done to help the community. She was a real asset to the council. She will be truly missed. 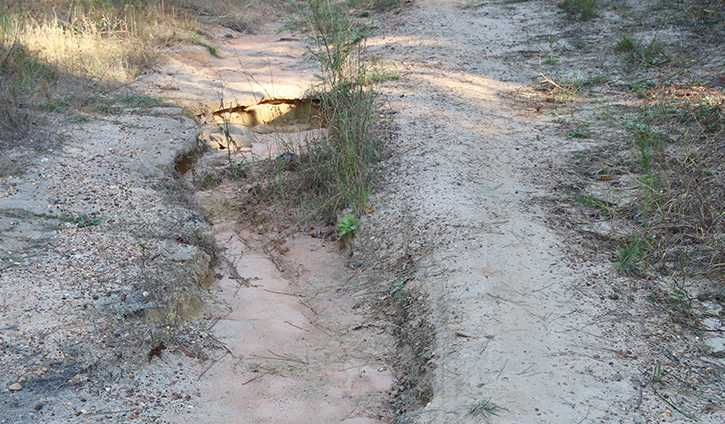 Pictured top: Century Town Council member Annie Savage. Pictured below: A black ribbon marks Savage’s passing at the Century Town Hall. NorthEscambia.com photos, click to enlarge. Ernest Ward Middle School recently announced Students of the Month for August. They are Savannah Doremus, eighth grade; Shelby Cotita, seventh grade; and Drake Driskell, sixth grade. Submitted photos for NorthEscambia.com, click to enlarge. 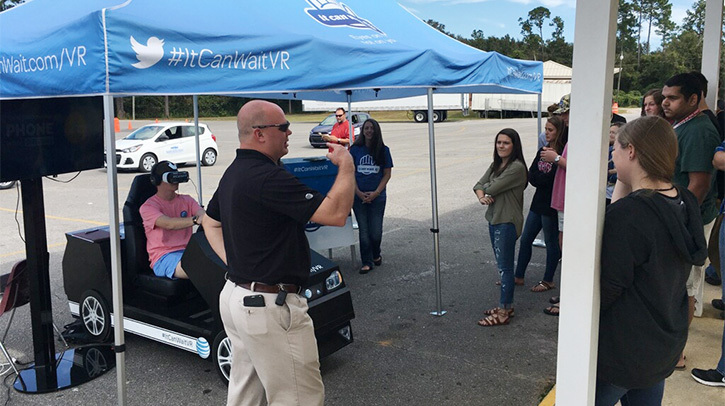 Tate High School students learned about the dangers of smartphone distracted driving Friday as part of the AT&T It Can Wait campaign. Research shows that people that are doing much more than just texting from behind the wheel, with 7-in-10 people engaging in smartphone activities while driving. 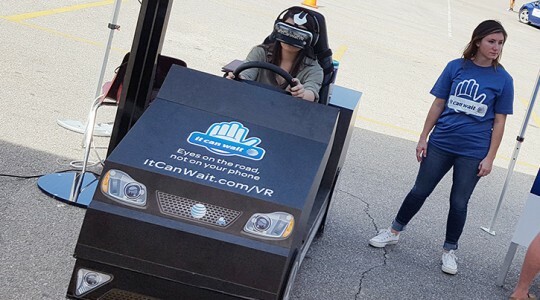 To drive home the message, AT&T’s It Can Wait Virtual Reality simulator stopped at Tate High School. 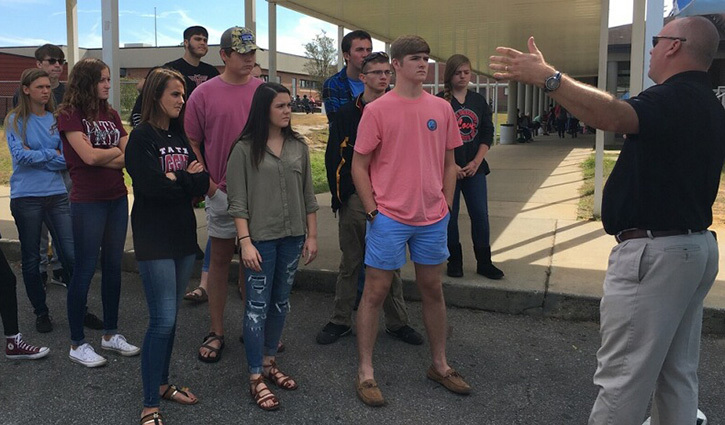 Students watched real life testimonies about the devastating consequences of distracted driving and experienced firsthand the dangers of not keeping your eyes on the road. It Can Wait is a national movement urging drivers to keep their eyes on the road, not on their phones. The campaign began with a focus on not texting and driving. 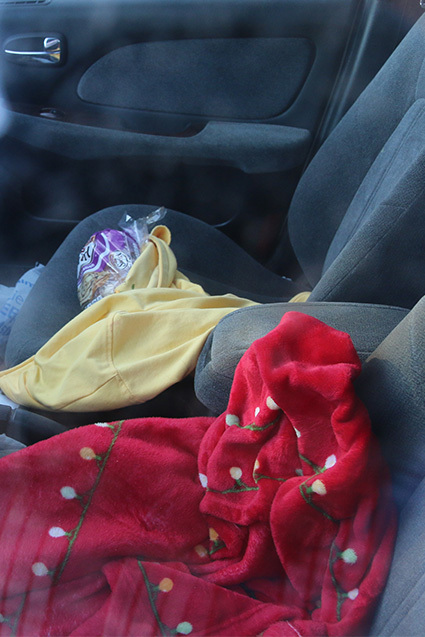 It has now expanded to the broader dangers of smartphone use behind the wheel. Pictured: The AT&T It Can Wait program at Tate High School on Friday. Photos for NorthEscambia.com, click to enlarge. 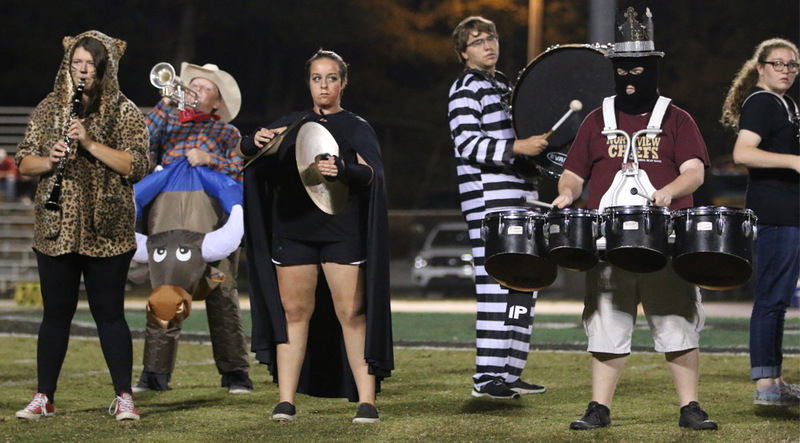 The Northview High School Tribal Beat Band dressed for Halloween last Friday night in Baker. 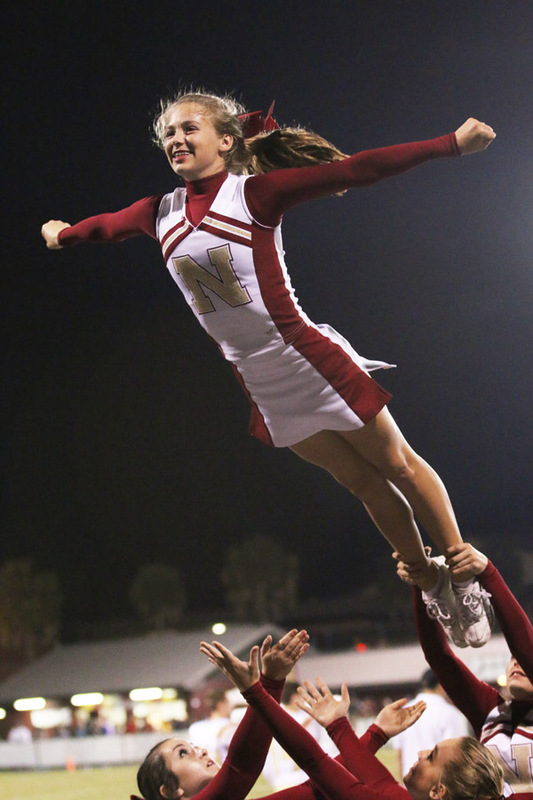 For a photo gallery from the show, and the NHS cheerleaders in Baker, click here. On Monday, The Hadji Shrine Temple at 800 West Nine Mile Road will have a Kid-Friendly Hayride from 6-8 p.m. for $5 an a Haunted House from 8-12 p.m. for $20. 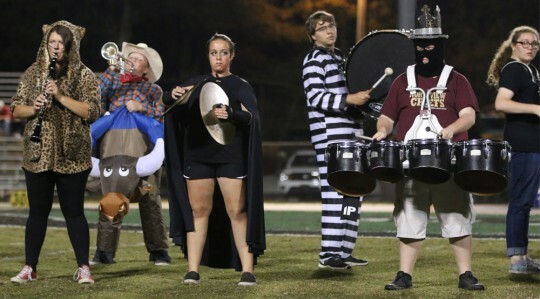 Heritage Baptist Church, on the corner of Hwy 297A and Sandicreek Road in Cantonment, is hosting their annual Trunk or Treat festival Monday from 6-8 p.m. The public is welcome to enjoy fun and games, rides, and treats with no tricks. Brooks Memorial Baptist Church will have their fall festival Monday, October 31 from 5 until 7:30 p.m. We will have a Trunk or Treat, bounce house, games, and food. Everyone is welcome. The local churches of the Molino community will hold their annual fall festival at Victory Assembly of God on Monday, October 31 from 6 p.m. until 8 p.m. There will be games, food, hayrides, trunk or treating and more. Victory Assembly is located on Highway 29 just south of Barrineau Park Road. Everyone is welcome to attend. Woodbine United Methodist Church in Pace will hold their Fall Festival on Monday, October 31, from 6 p.m. until 8 p.m. There will be hayrides, a dunking booth, and games for all ages, face painting, a bounce house and trunk or treating. There will also be a cupcake wall and a chili cook-off. The church is located at 5200 Woodbine Road in Pace. For more information, call (850) 995-0007 or email BrendaLewis@woodbine.org. Century Health and Rehab Center will hold a Halloween carnival on Monday, October 31, beginning at 3 p.m. There will be a fun house. Fun costumes are encouraged. The center is located at 6020 Industrial Blvd in Century. With no rain in October, the North Escambia area is now officially in a drought, according to the recently released U.S. Drought Monitor. 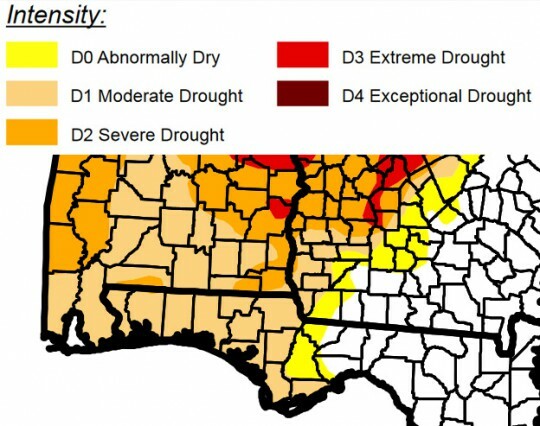 Most of the area is in a “moderate drought”, but a small area along the Alabama/Florida line, including Flomaton and Brewton, are in a severe drought. And unfortunately, there’s no relief in sight with no significant rain expected anytime soon according to the National Weather Service. Graphic for NorthEscambia.com, click to enlarge. Sunday: Sunny, with a high near 87. Calm wind becoming northeast around 5 mph. Monday: Sunny, with a high near 88. Calm wind becoming southeast around 5 mph in the afternoon. Monday Night: Clear, with a low around 53. Calm wind. Tuesday: Sunny, with a high near 85. Calm wind becoming east around 5 mph in the morning. Tuesday Night: Partly cloudy, with a low around 61. South wind around 5 mph becoming east after midnight. Wednesday: Mostly sunny, with a high near 83. East wind 5 to 10 mph. Wednesday Night: Partly cloudy, with a low around 60. Southeast wind around 5 mph becoming calm.